Duval Street is probably the most famous of all the streets in Key West, which is quite amazing after all the street runs for just a little over a mile in length. But man, it really means business with what it manages to cram into this mile of Old Town Key West. If you ask anyone about coming to Key West, they will definitely mention Duval Street as somewhere that you should go, as with hotels, bars, clubs, restaurants, galleries, shops, street entertainment, and fun and joyfulness with a capital “F” and “J” you will understand why it is on the tip of everyone's tongue. So on this page we will try our best to inform you with what is on offer, and provide a real insider's view of the real Duval Street. But we won't tell you everything there is. We don't want you to think that you have seen it all from the safety of your computer and not bother to come to the real place after all. Attractions To Enjoy On Duval St.
How Is Duval St. Set Out? So lets start with a bit of geography, so you can get your bearings and plan your attack on this amazing street. If you stand in the middle of Duval Street and look one way you will be viewing a vast expanse of water namely the Gulf of Mexico. Turn your head the other way, and another huge watery scene will come into view and this time is the Atlantic Ocean. This of course can lead it to flood every now and again, especially when the area has higher than normal rainfall. So for this rundown we will start at the Atlantic Ocean end, which you will find is the quieter end of the street, and definitely is more residential. So this is where the locals live, so you will find a lot less touristy. Which is the first of our great Duval Street tips, as if you fancy finding a hotel right on Duval Street, but are slightly concerned about the noise from the street keeping you awake through the night, then use our guide to the find the best one at this end of the street. At this end of the street as we were saying you will find a lovely mix of Victorian Mansions which are pure Key West, with much smaller bungalows sitting side by side. And although you will find the streets bustling with shoppers and interested browsers of the galleries and boutiques during the day, these places of course close up in the late afternoon, which leads to the better sleeping arrangements, which can make all the difference to your survival as Duval Street is a 24/7 type of street. Also down this end of the street is the world famous, and I suppose iconic photo opportunity which is the multi-coloured buoy, which marks the most southernmost point of the United States of America, and the most tourists you will see in one spot. So if you do want to take a photo at this Duval Street get down there early in the morning, or you will end up with some large man in too tight shorts somewhere in the back of the photo. At this end everything is named southernmost this, and southernmost that, with another iconic Duval Street landmark being the Southernmost House. This is an amazing looking Victorian mansion built back in 1896, and has been a favourite place to stay for the majority of the rich and famous that have fallen in love with Key West, such as ex-President Truman and Ernest Hemingway. Up at the north end you will find Mallory Square which is the home of the nightly sunset celebration. For years locals and tourists have gathered here, to watch the street entertainers that come out in force, do a bit of people watching, and cast their eyes on the world famous and amazing Key West sunset. It is also up this end of Duval St, where the huge cruise ships come into town and moor up. So if you are planning to come down to the southernmost point of America by sea ie Cruise ship or ferry, then you may want to get a hotel room at this end of the proceedings. For more information on both the cruise timetable, and services and ferry schedule simply click through on the images below. As we alluded to at the the top of the page, Duval Street hotels are very much sought after. Due to the proximity of the street to the best that Key West has to offer, you will find that these hotels are probably about 15% more expensive than hotels even a couple of streets further on. So although our guide will show you the hotels actually on the street, make sure you check out our other guides to hotels in Key West too. But if you are insistent on staying smack on the middle of the famous street then the hotels below will be the perfect places to check out. Probably our favourite of all the hotels is the Pier House Resort, which has been around for years, and with its private beach being available to its residents, you will have a lovely escape from the hustle and bustle, which can sometimes get people a bit down. 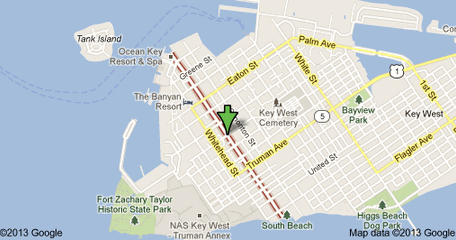 Galleries To Enjoy On Duval St.
Key West has always been a place that has attracted the talented and artistic. And it's not surprising with so many variations to the architecture you see around the place, the vibrant social scene, and of course the wonderful natural sunsets and wildlife. If you can't be inspired by this place, and feel the urge to grab a paint brush or two, then you must be well........a different person to me. And so as you wonder down the street, you will of course pass many bars, restaurants and clubs, but don't miss the chance to pop in and check out the galleries and artists that have set themselves up here. There are quite a few too. Once you hit this street there is only one way to go and that is on the crawl. If you fancy a bit of drinking, great fun, some unusual conversations and the chance to do people watching at its best then the "Duval Crawl" is what you want to be doing. Start at either end of the street, and take it easy and you will have a great time. 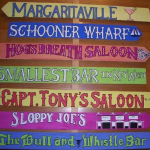 The guide below is the best bars on the crawl, at least according to our readers, but you certainly will have to try out Sloppy Joes, La-Te-Da and Aqau. All of them have been my spiritual homes for more than a few nights I can tell you! The Bull...Upstairs Is The Garden Of Eden So Leave Your Clothes Behind!! Also I know this is about Duval St. but my all time favourite bar is not actually on the street, but just round the corner. The Green Parrot is round the corner on Whitehead Street, and is well worth popping into, as you stagger around the route. So now you have a flavour of what being here is all about, did you know that you can take a look right here and now? There is a good resource which has web cams scattered around the street to keep an eye on the crowds, the bars or even a few people laying around the beaches. Don't spend too much time gazing at them, as that would be creepy, but still take a look and see what the streets vibe is today by clicking here.